The Corgi is a friendly, fearless little breed, both intelligent and playful, and equally quick on their feet. Although in agility contests it appears that the dog is doing all the work, the handler's role is of utmost importance. 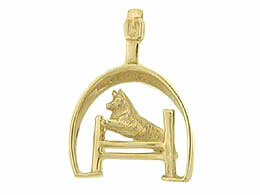 So treat yourself today for all your hard work with this most picturesque of pendants.